Our frangipani gift packs are the perfect gift for someone special. Or why not pamper yourself!! Drift away with the exotic scent of fabulously fragrant, sun-warmed frangipani. Spray on your body, pillow and around the room for a sensuous, tropical aroma. 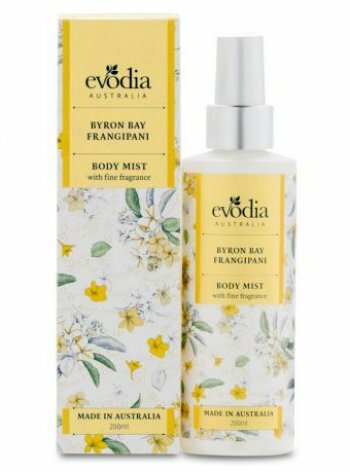 Evodia 200ml Frangipani Body Mist. Our Price: $23.95 - that's $2.00 off recommended retail price! Drift away with the exotic scent of fabulously fragrant, sun-warmed frangipani. Handy Handbag sized roll on - perfect for when you are on the go. 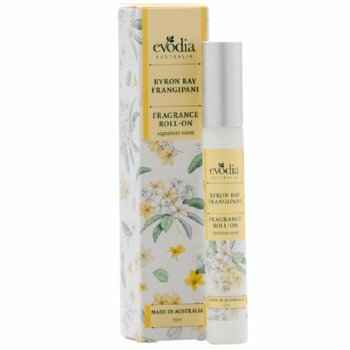 Evodia 15ml Frangipani Fragrance Roll On. Our Price: $11.50 - over 10% off recommended retail price! Treat your skin to a gentle cleansing wash infused with Aloe Vera and with the exotic scent of sun-kissed frangipani. Free from sulphates, parabens and harsh chemicals. 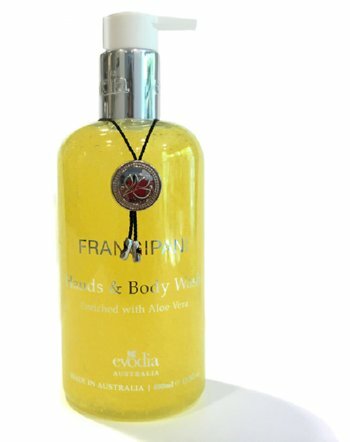 Evodia 400ml Frangipani Hand & Body Wash.
Our Price: $16.95 - over 10% off recommended retail price! Treat your senses to indulgence every day of the week with this divine hand and body lotion. You'll absolutely love the vibrant frangipani fragrance, housed in a pump bottle for easy dispensing and beautifully presented in an attractive gift box. 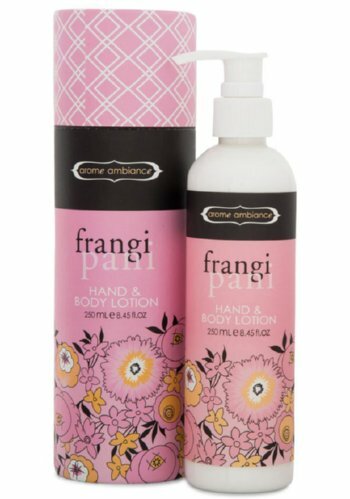 Arome Ambiance 250ml Pink Frangipani Hand & Body Lotion. A creamy and deliciously scented vegetable-based soap bursting with the delicate sweetness of frangipani. Enriched with Shea Butter and Vitamin E to leave skin hydrated, smooth and luscious; and natural Coconut Shell Powder for gentle exfoliation. Free from sulphates, parabens and animal fats. Presented in a rust proof tin for your travelling pleasure. Evodia 200g Frangipani Exfoliating Soap Bar. Our Price: $13.40 - over 10% off recommended retail price! Copyright © 2016 All Things Frangipani. All Rights Reserved.